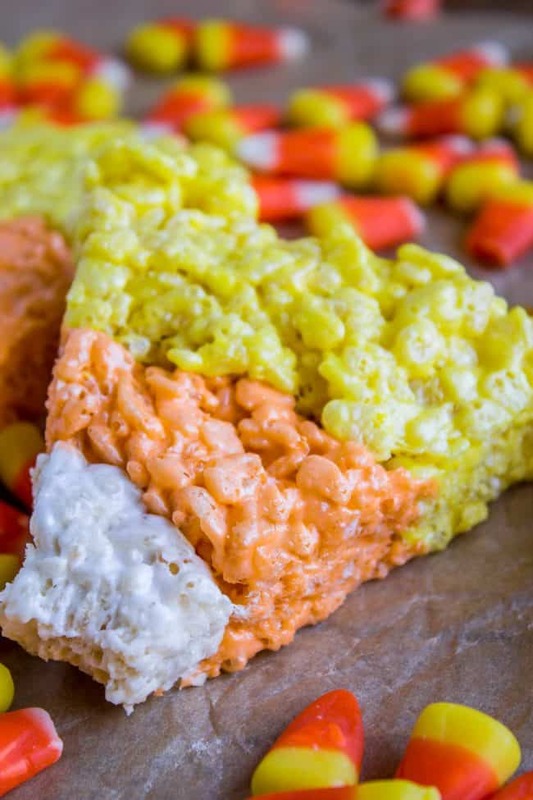 Halloween Rice Krispie Treats are perfect for a Halloween party! 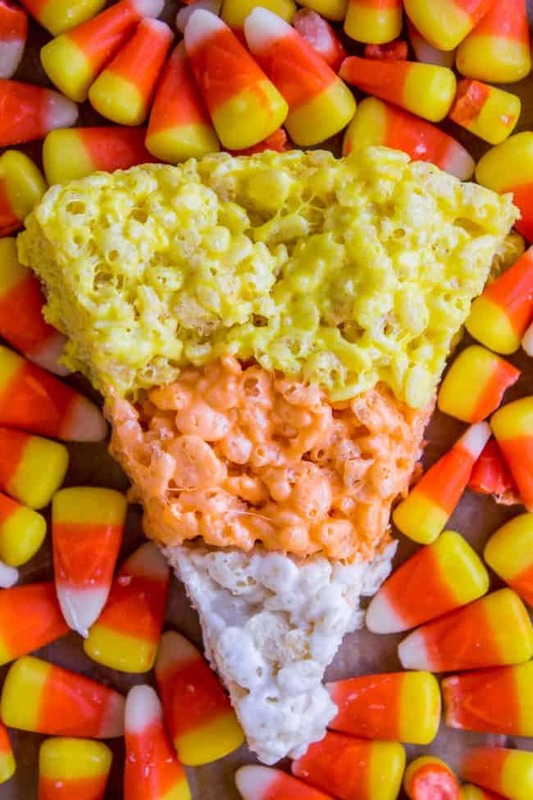 The kids will love the Candy Corn shape. Not only are they SO easy, but they are the BEST recipe for Rice Krispies treats! 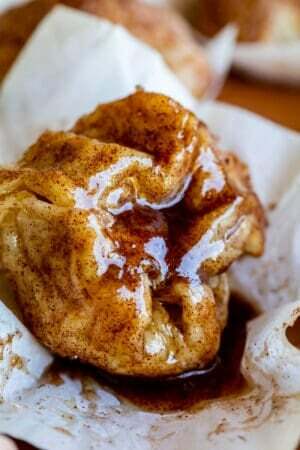 So incredibly gooey. 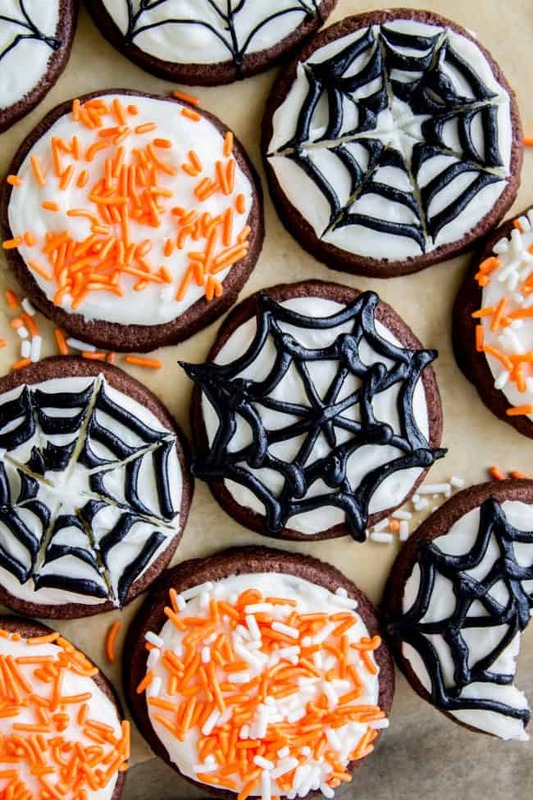 Easy Halloween treats are a lifesaver! Somebody asked if I was pregnant yesterday. Spoiler alert, I’M NOT. Yes, it was a man, and no, I did not kill him. He’s still out there. 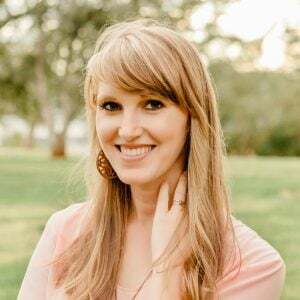 Beware, women everywhere who live somewhere in that state between their lithe, former selves, and that awkward stage where you could either be in the early stages of pregnancy or just coming off a weekend of tacos and pizza. You could be next. Meanwhile, I’m over here doing 1,000 jumping jacks because there’s no way in heck I’m going to stop eating tacos and pizza. 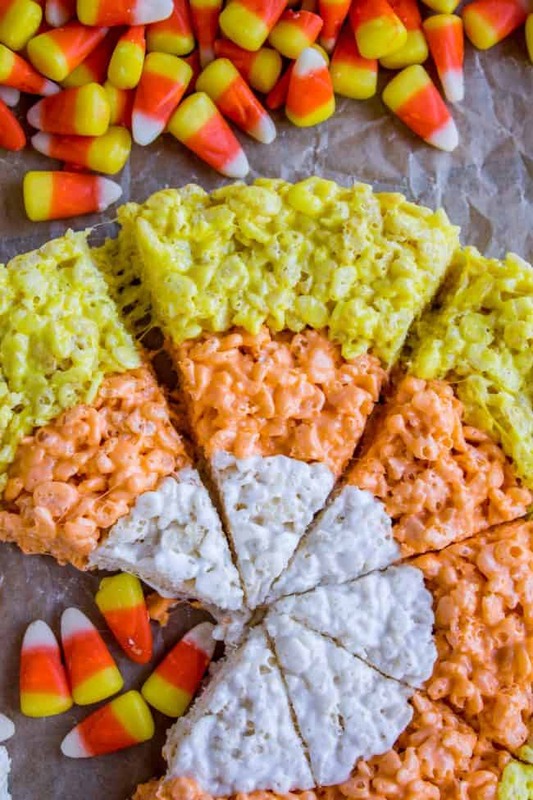 Or Halloween Rice Krispie treats, for that matter. You can’t stop the Halloween. One time when I was a kid, my Sunday School teacher brought Rice Krispie treats to class. They were so tough that I could hardly bite through it, and I ended up loosing a tooth (it was already loose, but still). Ever since then I have been extremely wary of too-hard-Rice-Krispie-Treats for fear of dental mishap. 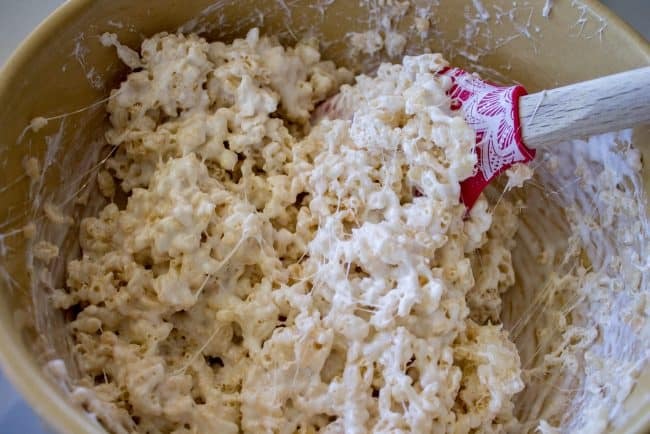 This means that any Rice Krispie Treats that come out of my kitchen are, as a direct result of previous trauma, super soft and over the top marshmallow-y. I’m warning you. They are sticky. This is not an apology. 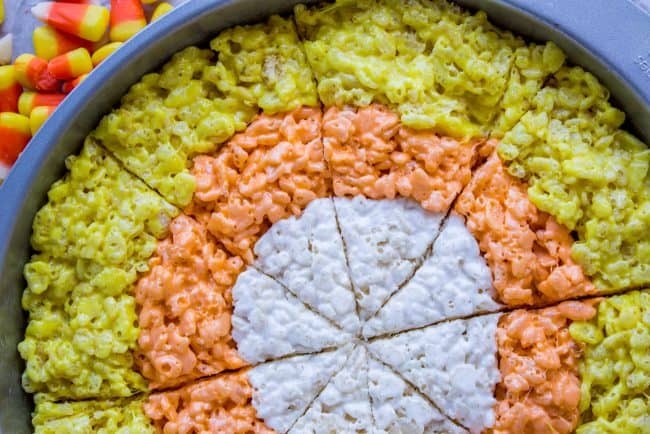 It’s easy to make these Candy Corn Rice Krispies Treats; all you need are a couple of round cake pans. You don’t even need the stove, just a few bowls to stir the different colors in. It seriously takes like 10 minutes. I started with the white center of the candy corn first, but you could do the yellow part on the outer edge first if you wanted. I brought these easy Halloween treats to school pick up on the day that I made them, and was offering them out to the general mayhem of kids and adults trying to find each other and get home. A man and his daughter passed by and I offered one to both of them. The girl took one, the dude said no thanks. Several minutes later, after passing out most of the rest of the treats, the guy came back, said he had changed his mind, and ruefully took the last one. No judgment here, friend. Just make sure you don’t eat too many, or your friends might think you’re pregnant. Prepare 3 microwave-safe bowls by spraying the inside with nonstick spray. Spray two 8 or 9 inch round cake pans and set aside. For the White section of the candy corn: In the first bowl, add 1 tablespoon butter, 2 PACKED cups mini marshmallows, and a dash of salt. (Push the marshmallows down into the cup until you can't fit anymore.) Microwave on high in 30 second intervals until the marshmallows have just started to melt. Don't over do it. Stir together until it's smooth, returning to the microwave as necessary. Add 2 cups Rice Krispie cereal. Stir together. 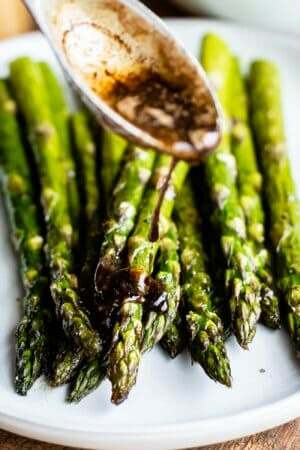 Spray your hands with nonstick spray or rub with butter. Divide the mixture into two and shape each one into a circle about 3 and 1/2 inches across. 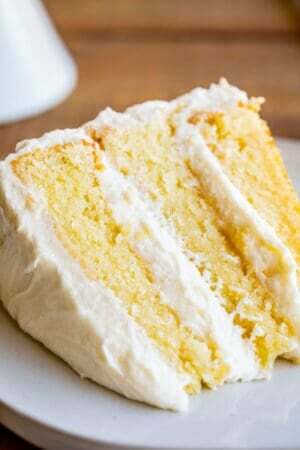 Place each one in the center of the cake pans. For the Orange section of the candy corn: In the second bowl, add 2 tablespoons butter, 3 PACKED cups mini marshmallows, and a dash of salt. (Push the marshmallows down into the cup until you can't fit anymore.) Microwave on high in 30 second intervals until the marshmallows have just started to melt. Don't over do it. Stir together until it's smooth, returning to the microwave as necessary. Add orange food coloring and stir. Add 3 cups Rice Krispie cereal and stir together. Butter your hands again and divide the mixture in two. Wrap each one around the white circle in the cake pan. Smooth it together, pressing the orange section in so that there is room for the yellow section. 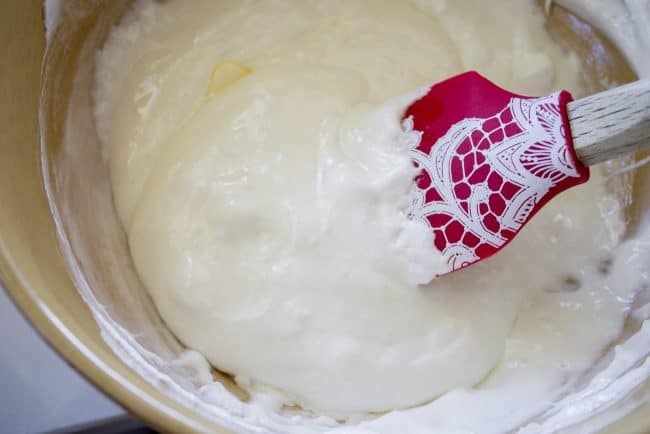 For the Yellow section of the candy corn: In the third bowl, add 2 and 1/2 tablespoons butter, 4 PACKED cups mini marshmallows, and a dash of salt. (Push the marshmallows down into the cup until you can't fit anymore.) Microwave on high in 30 second intervals until the marshmallows have just started to melt. Don't over do it. Stir together until it's smooth, returning to the microwave as necessary. Add yellow food coloring and stir. Add 4 cups Rice Krispie cereal and stir together. Butter your hands again and divide the mixture in two. Wrap each one around the orange section in the cake pan. Smooth it together, pressing firmly to make sure it is even across the top. Let sit at room temperature until cool. 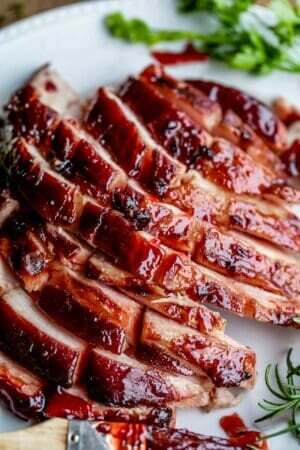 Or toss it in the fridge or freezer for 10 minutes and it will be chilled in no time. 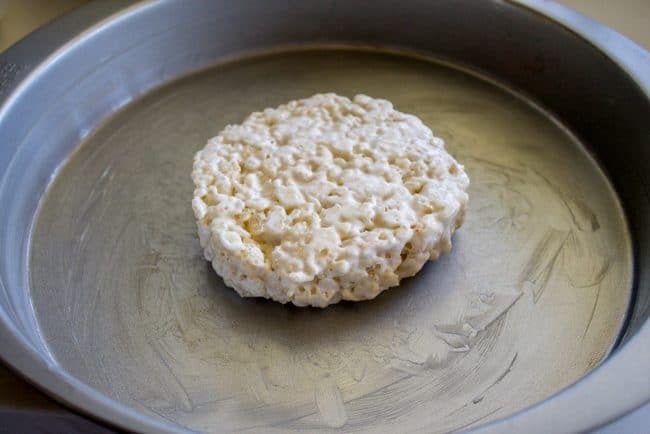 Use a plastic knife to wedge the entire circle of Rice Krispie treats onto a work surface, then cut it like a pie into 8 slices. You can slice it in the pan if you want, just make sure you don't scratch your pan, especially if you don't have a plastic knife. Serve immediately. These can be made up to 24 hours in advance. Keep covered tightly and store on the counter. *You will need to buy two (1 pound) bags of mini marshmallows, but may not use it all. More Halloween treats to get in the spooky spirit! 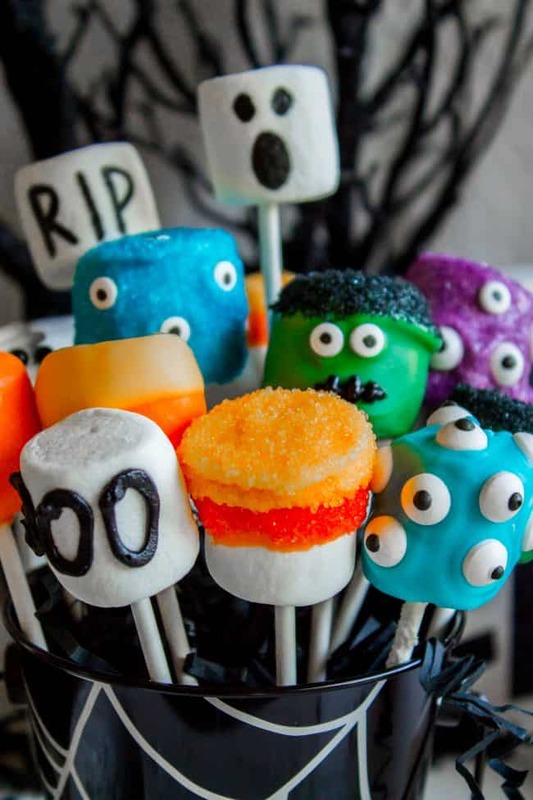 Halloween Marshmallow Pops << kids love these! 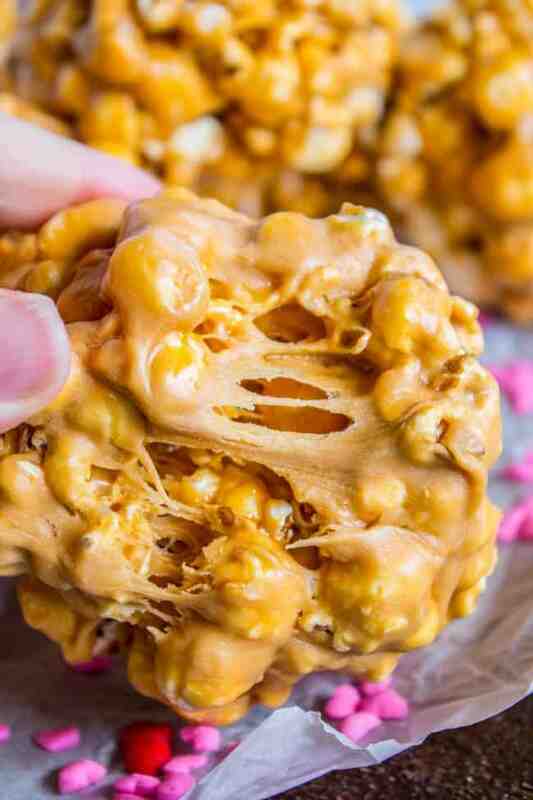 Butterscotch Popcorn Balls << these are so easy! The Softest Chocolate Sugar Cookies << these are the best!! 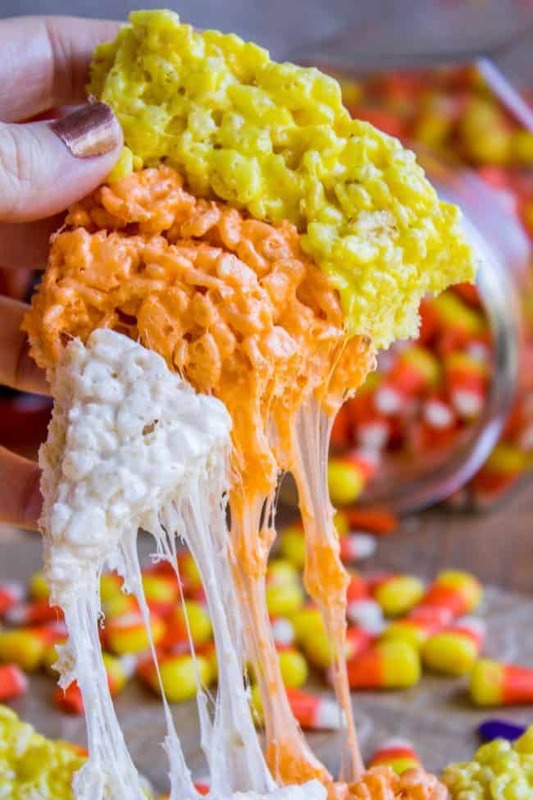 More candy corn treats you should try out for Halloween! 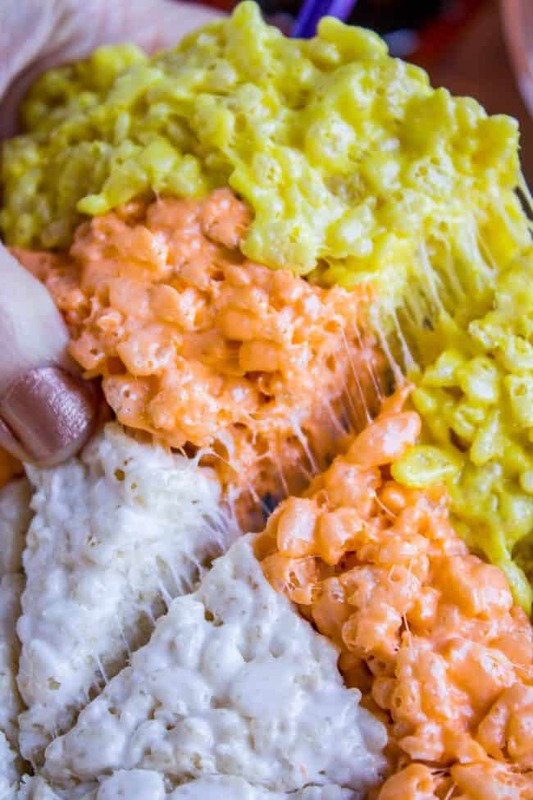 Candy Corn Krispie Treats from Glorious Treats << I think Glory was the first one to come up with the Candy Corn shaped rice Krispie! She’s a genius.